Out of all the rumors, the one I want to be true the most is the higher resolution display. This is the only upgrade that would convince me to upgrade my iPad1 to an iPad2. However I agree with all the pundits that it is unlikely. The technology just doesn't seem to be there yet. :( Is Jobs doing the presentation? If he doesn't, it just won't be the same. NFC as a maybe?... What would it be used for? I can comprehend it going in to the iPhone 5 if they can pull off a good e-wallet solution, but I just can't imagine what use it would have on an iPad. What were your thoughts when you put it as 'maybe' and not 'long shot'? Do you have some other use in mind? So... if the new MacbookPro was released today does that mean that the new iMac is coming soon.. Should i wait to buy was wanting to buy new iMac this coming weekend..
My thoughts on the 512 MB ram vs 1GB RAM is that either could happen. But I felt 1GB was more likely than 512 MB - it just did not seem I could put either in Likely - and putting both in Maybe seemed odd as well. One of the two will likely happen - just not that I did not feel as confident with either as I do with the others in the likely category. But if you wanted me to pick one over the other - as I said above it would be the 1GB option. 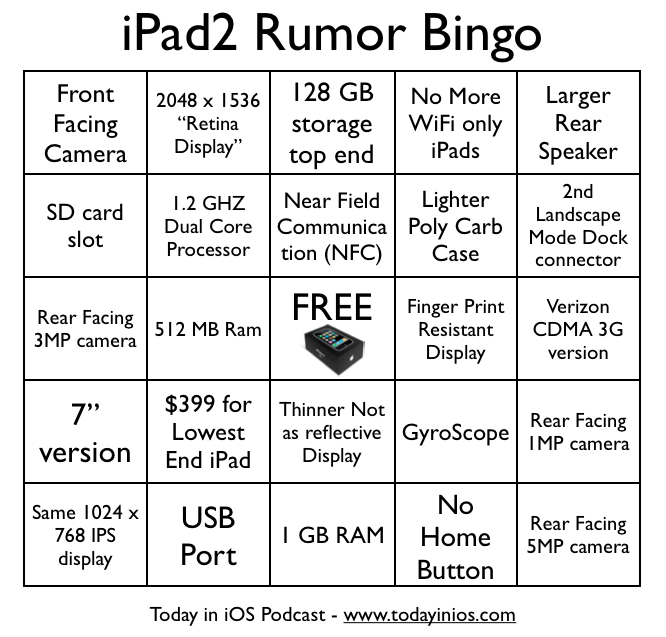 $399 lower price point would be a nice addition, especially if non-early adopters start buying up the 1st gen iPads. Anything that addresses glare short fall. I think your other long-shots and no chance bets are probably right on track. Why do you say 512 ram is a long shot? Seems like it should have it.